Companies are constantly facing the challenge of maximizing performance and efficiency of employees while making tasks, products and jobs compatible with human capabilities and needs. Ergonomists have to maximize productivity while also reducing operator fatigue and discomfort. A crucial element is knowing the pressure exerted by the hand when gripping and using objects. The Grip™ System can be utilized to identify and examine forces and pressure felt by each finger, the thumb and palm, improving product design and/or optimizing employee performance. 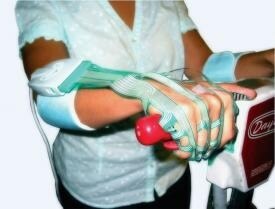 The Grip pressure mapping system records the dynamic pressures and forces hands and fingers apply while gripping, grasping, holding, lifting, moving and using objects. This allows one subject to sequentially grip several objects in a variety of ways. Sensors are available in different shapes, are reusable, and give accurate pressure readings. Pressure data collected while subject operates an industrial floor polisher. 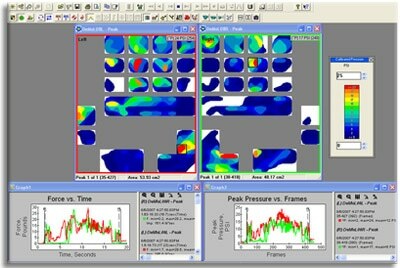 Comparisons of Force vs. Time and Peak Pressure vs. Frames are shown for both the Left and Right hands. 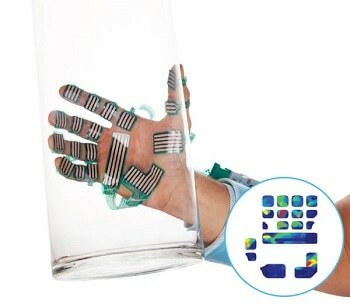 Peak pressure areas detection occurred on the left hand along the palm, while the right hand experiences greater pressure in the middle phalanx of the second finger.